What are the benefits of registering with NESCAFÉ® DOLCE GUSTO® online? When you register your machine you can look forward to lots of great things from the NESCAFÉ® Dolce Gusto® Team. Be the first to receive latest news, tips and special offers. Pop in to our webshop where you can buy a huge selection of great tasting coffees and stylish accessories. Our accessories are only available online. Register your machine and with your unique machine code to receive a $10 webshop credit. Claim your $10 web shop gift voucher by adding your unique code from the back of the “Your Guide To Seriously Good Coffee” booklet which comes with your machine. There may be an insufficient seal between capsule and machine. Check that there is a capsule in the holder. Stop machine, wait for light to stop blinking and remove capsule. Check to ensure that capsule is not pierced twice. Try again with new capsule. If leakage persists, contact our NESCAFÉ® Dolce Gusto® team on 0800 365 234 for assistance. Machine is on but there is no flow of beverage out of the holder. Check if there is water in the water tank. If no, fill tank with water and start again. If yes, The needle in the head of the machine may be blocked. The unblocking tool, which came with your machine, should be inserted into the needle to dislodge any blockage (the unblocking tool is metal and looks like a partially uncoiled spring). Before using the unblocking tool, please unplug your machine and let it cool; remove the capsule holder from the machine and lower the central lever. Often an air bubble can be stuck inside the machine, inhibiting water flow, lifting the water tank up and down a number of times can be useful in moving this air bubble. We suggest lifting it up and down 6 times, then trying to achieve flow. This can be repeated numerous times. We would then suggest descaling your machine. 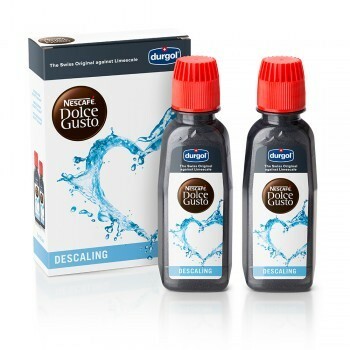 We recommend using Delonghi descaling solution to descale your NESCAFÉ Dolce Gusto Machine. If you have any questions about the descaling or unblocking process please do not hesitate to call us 0800 365 234. Why do I sometimes get different foam levels? The level of foam depends on the size of the cup, the position of the drip tray, and sometimes the milk and coffee powders which are natural products that might show a small seasonality effect. If the foam amount is significantly lower than normal, please use another box of capsules and contact our NESCAFÉ® Dolce Gusto® team on 0800 365 234. During beverage preparation coffee/milk is splashing out of the cup. Adjust the drip tray support to the correct level in order to not be too far or too close to the spout. Use another cup size or the recommended NESCAFÉ® Dolce Gusto® cups. The beverage is coming out at an angle and not straight into the cup. The quality of the final beverage is not impacted and can be consumed. Before preparing the next cup, clean and dry the capsule holder, particularly the beverage outlet opening. Once I finish beverage preparation and stop the machine there is still continuous dripping of product into the cup. This is normal: as long as the capsule is not removed and discarded it will continue to drip into the cup or the drip tray (once the cup is removed). The dripping lasts longer for coffee capsules than for milk capsules. To stop dripping, remove and discard the used capsule after the light stops blinking. Upon removal of the holder and the capsule from the machine, some water/product drops are coming out from the top of the needle. It is likely that you removed the holder from the machine too soon. Always wait for the light to stop blinking before removing the holder from the machine. It is difficult to remove the capsule holder from the machine at the end of beverage delivery. Do not try to remove the capsule holder too soon. Always wait for the light to stop blinking. If still difficult to remove, do not force. Switch off the machine and wait for 5 minutes before trying to remove. It is important to clean your capsule holder after each use, to ensure no residual product is causing stickiness. Once the beverage is delivered to the desired strength/volume any remaining water (and some product traces) remains in the capsule in order to not dilute the taste of the beverage. Some products (e.g. coffee capsules) are designed to flow slower than others (e.g. milk capsules) in order to achieve the desired cup quality. If flow is slower than normal, descale the machine (following Quick Start instruction Manual) and clean needle by removing any obstacles lodged in it. Some products (e.g. coffee capsules) are designed to flow slower than others (e.g. milk capsules) in order to achieve the desired cup quality. If flow is slower than normal, descale the machine (following the instruction from the machine enquiries section above or here) and clean needle using your unclogging tool (the unblocking tool is metal and looks like a partially uncoiled spring)which will help to remove any obstacles lodged it. The taste of my coffee is too strong or too weak. The products are expertly designed to deliver perfect taste with the dosage as shown. You may want to vary the amount of water using your selection lever until desired taste is reached. My payment has not gone through? Credit Card: Please make sure you are using a Visa or MasterCard credit or debit card. Name on credit card: Please type this exactly as it appears on your card. Credit card number: This is the 16-digit number on the front of your card. It is important to enter this with no spaces. Expiry Date: Use the drop down boxes to select the correct month and year of expiry. 3 digit security code: This is the last 3 digits from the signature strip on the back of the card. If you are still not able to submit your order, please call our NESCAFÉ® Dolce Gusto® team on 0800 365 234. I’m not sure if my order has gone through. If it has gone through, we will send you an email confirming we have received your order. Make sure to check your email junk mail folder. If you have not received your confirmation e-mail with 24 hours, please call our NESCAFÉ® Dolce Gusto® team on 0800 365 234. Where is my order/when will it arrive? Once your order has been posted, you will receive a Shipment Notification email with tracking information. Please call our NESCAFÉ® Dolce Gusto® team on 0800 365 234 for further help. 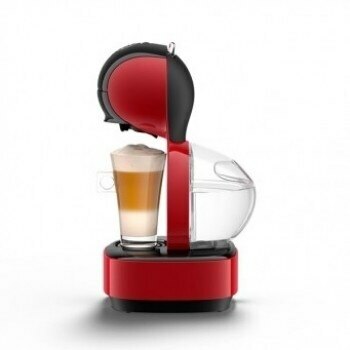 The NESCAFÉ® Dolce Gusto® machine pumps water at up to 15-bar pressure into the NESCAFÉ® Dolce Gusto® capsule. The high pressure and the capsules are designed to deliver an even distribution of water and pressure over the coffee to get the full flavour. This system uses pressure similar to that of professional cafe quality machines. Can I order spare parts for my machine from you? If you need replacement parts for your machine please call our NESCAFÉ® Dolce Gusto® team on 0800 365 234 and we will be happy to help. My machine has stopped working. If you’ve tried descaling and unclogging the injector as explained in the machine leaflet, and are still having problems, please call our NESCAFÉ® Dolce Gusto® team on 0800 365 234. What does descaling do to my machine? There are minerals such as calcium and magnesium that are naturally present in most water supplies. The accumulation of these minerals may cause the build up of limescale. Over time, limescale slows waterflow, reduces the capacity and could reduce the effectiveness of heating the water used to make your drinks. Descaling every 6 months or 300 uses gets rid of the build up of limescale, keeping water flow fast and pump pressure high. I need to descale my machine. We recommend using the NESCAFÉ® Dolce Gusto® Descaling Kit to descale your NESCAFÉ® Dolce Gusto® machine every 6 months. This can be purchased directly from our online shop. How do I descale my MELODY, GENIO or CIRCOLO machine? Make up descaling solution as per the manufacturer’s instructions and then fill water tank with solution. Insert empty capsule holder into machine and place jug underneath. Press and hold power button for at least 5 seconds. Power button starts blinking green and machine enters the descaling mode. Press hot water button. Bar display begins to count down. Machine descales in start-stop operation for approx. 2 min. The bar display and power button are blinking green at the end of the descaling cycle. Empty jug. Rinse and clean water tank thoroughly. Fill water tank with fresh, drinking water up to max. level. Press hot water button to start rinsing. Bar display begins to count down. Wait until the machines stops, and power button changes back to green. Empty jug. Fill water tank with fresh, drinking water up to max. level. Press cold water button to continue rinsing. Bar display begins to count down. At end of rinsing cycle power button lights up red and bar display counts up. Wait until machine switches back to normal operation. Then switch off machine. Remove and empty jug. Refill water tank with drinking water and place it back on the machine. Attach drip tray. Wipe your machine with a dry clean cloth. What is the difference between the machines in the range? You can find out all about our machines including full descriptions here. Can I use other branded capsules in my NESCAFÉ® Dolce Gusto® machine? And is it safe to use compatible or refillable capsules with my machine? 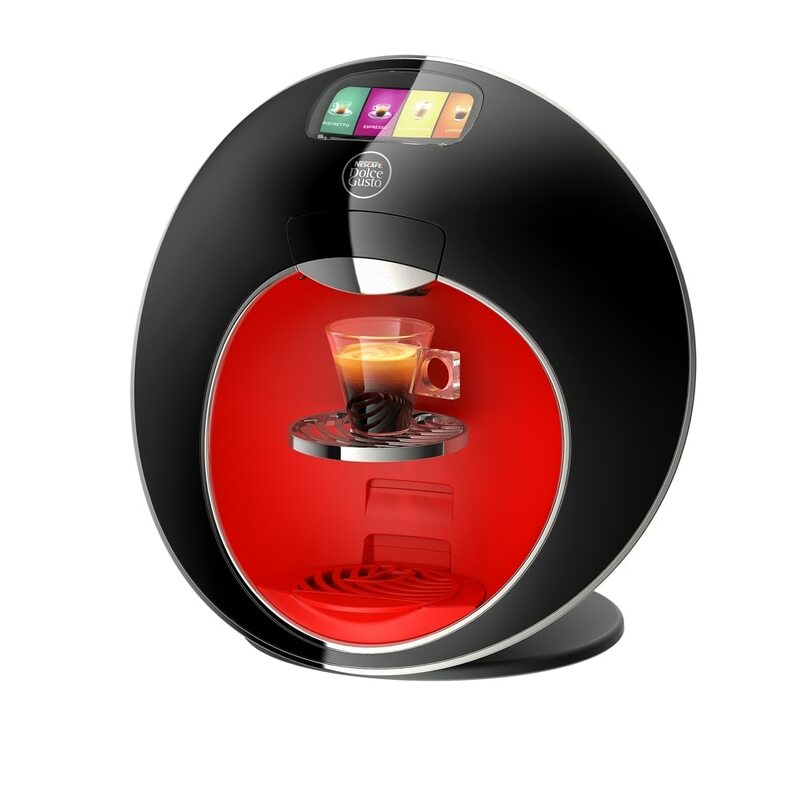 We cannot comment on other companies’ capsules’ fit with NESCAFÉ® Dolce Gusto® machines. The NESCAFÉ® Dolce Gusto® capsules and the NESCAFÉ® Dolce Gusto® machines were designed to interact together - the interaction provides the in-cup quality that NESCAFÉ® Dolce Gusto® is known for. Can you use other coffee capsules or only NESCAFÉ® Dolce Gusto® capsules? 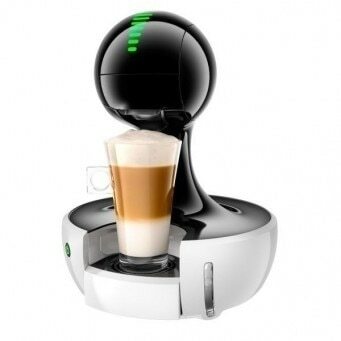 Only NESCAFÉ® Dolce Gusto® coffee capsules are suitable for use with this machine. They are the only capsules that were developed to fit and that correspond to the high quality requirements for this system. Yes, all NESCAFÉ® Dolce Gusto® capsules can now be recycled via our partnership with experts TerraCycle®. For more information on how to start recycling today visit www.terracycle.co.nz. You can buy a wide range of capsules directly from our online shop or a more limited range from leading grocery stores and some electrical retailers and department stores. To find out which store sells the capsule you are after, simply click here. Yes, all of our capsules are Halal. Are the Capsules Gluten Free? Yes our capsules are all gluten free. Do the capsules contain soy milk? No, none of our capsules contain soy milk. Is there lactose free varieties? All of the capsules that do not contain milk are lactose free, this includes Espresso Intenso, Espresso Ristretto, Americano, Espresso Decaf and NESTEA Iced Peach Tea. Are the capsules vegetarian or Vegan? All of our capsules are Vegetarian, however only the capsules that do not contain milk are lactose free, this includes Espresso Intenso, Espresso Ristretto, Americano , Espresso Decaf and NESTEA Iced Peach Tea. Why aren’t milk capsules sold on their own? Unfortunately the NESCAFÉ Dolce Gusto Milk capsules are not available on their own at this time. For preparing Cappuccino or Latte Macchiato you recommend using the milk capsule first. Why? By using the milk capsule first and then the coffee capsule, the foam of the final beverage remains white. This is the authentic way of preparing these beverages. If the opposite is done, the foam becomes brown. However, there is no problem with the taste or enjoyment of the cup. Are there coffee capsules without the milk? Our Milk Free varieties include Espresso Intenso, Espresso Ristretto, Americano , Espresso Decaf and NESTEA Iced Peach Tea. I am preparing my drink and only milk is coming out. For milky drinks such as Latté Macchiato, Cappuccino or Hot Chocolate, you will need to use two capsules - one of which contains the milk. The top of the capsule will tell you which drink it is, but you will need to look at the colour of the base to see which kind of capsule it is, whether milk, coffee, chocolate or a cold variety. The milk capsules have a white base and the coffees are black or dark brown. The chocolate capsules have a light brown base, while cold drinks have a silver base. How much coffee will I need for one cup? All our drinks require one or two capsules. The amount of water you add to each is of course up to you, but our suggestion for how to prepare each hot drink is printed on the box and on the top of each capsule. How do I know which capsule to use for which drink? How do the capsules work? The capsules are created with patented smart capsule technology to give you cafe quality beverages every time. When a capsule is inserted, a needle pierces through the capsule seal. Water enters the capsule and pressure begins to build, pushing the water evenly through the coffee. As the pressure builds to its optimum level to maximize the flavour, the seal at the bottom of the capsule is broken and the coffee begins to flow into your cup. Can I reuse a capsule? No, our capsules are designed to give you the perfect cup everytime and are not suitable for making two cups. 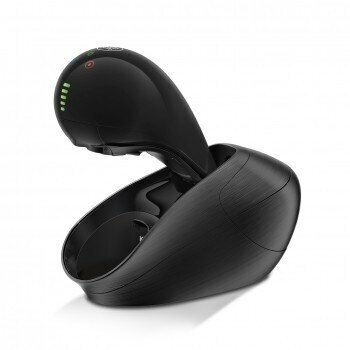 Where can I buy NESCAFÉ® Dolce Gusto® accessories? Our accessories are available for purchase through the online shop only. Click here to browse through the range and shop.